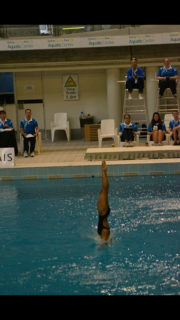 At only 151cm, Teju Williamson is taking on the giants of diving from way up high. The MLC Symphony Orchestra violinist is fast becoming a powerhouse of platform diving, climbing 10 metres to what she hopes will one day become Olympic glory. Technically, Teju already has gold medal winning dives. She says she trains for at least 25 hours a week to perfect her moves. "You can't see anything. You have to go by muscle memory and by feeling it," Teju said. Throughout 2015 Teju has competed in national and international events while continuing her Year 11 studies. At the end of the year she will sit the Year 12 Music exam which will go towards her ATAR score in 2016. Teju says she can't remember why she ever made the climb to the 10m platform, but puts it down to the bravado of an 11-year-old. "You just do it when you're little – you don't think of any consequences. I don't know why I keep doing it." With more and more international competitions on her agenda, Teju has her sights firmly set on the 2020 Tokyo Olympics. She is competing in the 2015 Grand Prix series which will culminate on the Gold Coast where the Australian team for the 2016 Rio Olympics will be chosen. 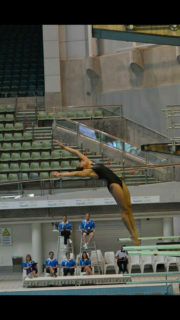 Under the guidance of her coach Shannon Roy, Teju aims to perfect her favourite platform dive, the inward 3½. It's the dive that won her the 2015 Junior Elite title in Sydney, but also cost her a podium place at the Grand Prix in Spain. "The nerves got the better of me in Spain," she said. "I'm usually more nervous about the actual dive itself rather than the height."